Working as an estate agent can be challenging and you may be faced with a high pressure working environment depending on the type of job you take. Estate agents are all about sales, so you should keep this in mind if applying for positions within an estate agency. Estate agents should also have people skills. If you have an outgoing and likable personality you can use this to your advantage it can help compensate for a lack of formal training. Kevin was 20 years old and had just graduated from university, he had only recently thought about pursuing a career as an estate agent so he had not tailored his degree to any specific estate agent needs. His degree was in English, but he had been told by a careers adviser that this would not necessarily be a hindrance. “I wanted to stay living at home during my first few years of working so I could save some money to buy my own property. My parents lived in a small town in Cumbria so I was not hopeful that it would be easy to find work as an estate agent,” explains Kevin.A lot of the better paid estate agency jobs are in the big cities and the differences between working in a big city or a small town can be vast. Starting out as an estate agent can be tough, pay is not always high and you will have to learn the ropes starting at the very bottom. “Even though I had a degree I soon learned that the estate agency business was not about formal qualifications. I was told that to progress or enter the sector at a higher level it would help if I had studied engineering or completed a surveying course. However for what I was doing this was not needed,” he says. If Kevin had been living in a large city such as Manchester or London he may have been able to sign up to a firm’s graduate scheme, which many larger estate agents operate. “I started at the bottom and for the first couple of weeks I was mainly doing administration work. I was computer literate from university so this helped. I was mainly answering the telephone and acting as an assistant to the agents,” says Kevin. The day-to-day life of an estate agent can be a busy one so it is important you are well organised. Much of your day as an estate agent will be spent driving to different locations and booking viewings. You will need to be calm and work well under pressure, as well as being good with numbers. “After a couple of months at the firm I started to take on more of the role of an estate agent. I was meeting clients and trying to find their new home. I was essentially trying to sell or rent out as many properties as I could,” says Kevin. Working as an estate agent does have its rewards for those candidates that are successful. 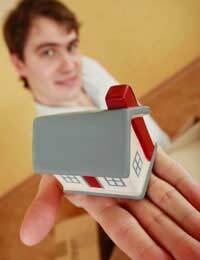 There is the potential to earn large amounts of commission if you successfully sell a property. “I was getting lots of hands on experience and learning the trade through my day-to-day work. I soon learned why it is that estate agents are among some of the least trusted professionals in the UK. I found it was all about persuading the client to choose the property that was on your books,” says Kevin. While working as an estate agent is a physically active profession, you will also be expected to do your fair share of paperwork, as there will be contracts to draw up and records to keep. An estate agent may not be the safest job to have in a property crash, but the profession itself is still relatively stable as there will always be the need for people to buy or rent a property.